The world indeed belongs to those willing to take risks, in this case, however, calculated risks. This can’t be truer than with the game risk. A board game where players aim to conquer the world through battles, conquests and diplomacy forming alliances and breaking them. 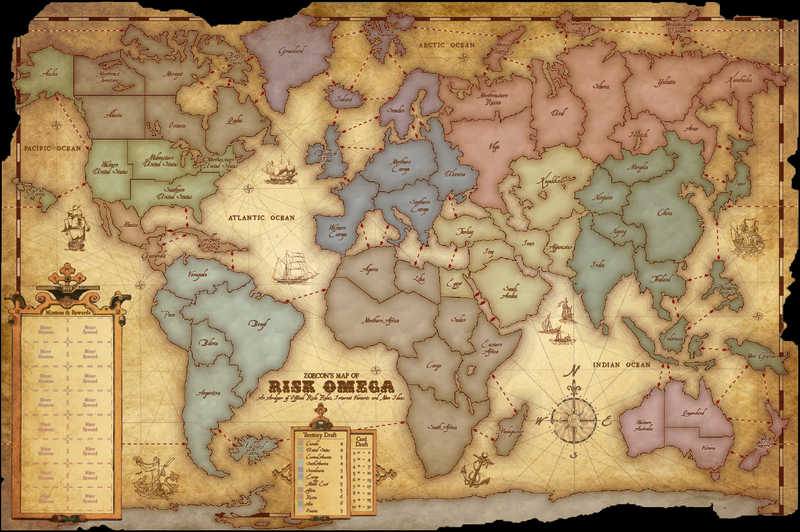 The game is played on a large board with the six continents of the world all marked in different colors divided into 42 territories. A complete set consists of six sets of troops with each troop made up of: an infantry, a Calvary which is worth 5 infantries and artillery worth 2 Calvary. A set also comes with a deck of Risk cards, made up of 42 territory cards, two wild cards, and mission cards 12 or 28 in number. Players can trade these cards for armies as the game progresses. To set up the game, each player selects a color and count out infantries depending on the total number of players in the game. E.g., three players count 35 infantries, 4 counts out 30 and so on. A die roll is used to determine who picks a territory first and then each of the players take their turn to select the remaining unoccupied regions until all the lands have been claimed; each player then proceeds to place armies in their claimed territories. The draw pile of cards is shuffled, and the first player opens the game. 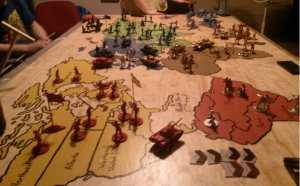 The risk is a game of strategy with the primary goal of capturing as many territories as possible and with each turn of play, each player can decide to either place new armies, attack an opponent’s territory or fortify his own position. Battles are fought by the roll of the die and players can only attack territories adjacent to theirs or connected to it by a dashed line. The player must, however, have at least two armies in the opponent’s territory for an attack to be possible. During an attack, the attacker will roll 1, 2 or 3 red dice while the player on defense will roll either 1 or 2 white dice. The attacker must also have at least one more army in his territory than the number of dice he rolls. The odds of winning a battle depend on rolling more dice. Yet the chances of losing more players becomes higher the more dice you roll. 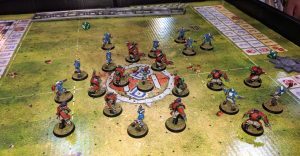 The winner of each battle is determined by comparing the highest die rolled by each player. The player with the higher die wins and the losing player will lose an army from his attacked territory. The player who succeeds in capturing all 42 territories wins the game. Several video and computer games versions of the game are available, and players can also play the game online on various online platforms.